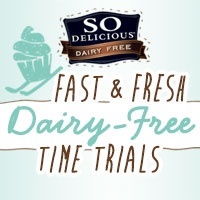 This is an entry for the So Delicious Fast and Fresh Dairy-Free Time Trials. This recipe can be made in 30 minutes or less (Category #1). 1. In a large soup pot, blend So Delicious Original Culinary Coconut Milk with flour over low heat. Use a flat whisk to break up all flour lumps; stir until mixture begins to thicken. 2. Add chicken broth and continue to use whisk to blend in flour mixture. 3. Stir in all remaining ingredients except bacon. Bring to low boil over medium-high heat. 4. Reduce heat to low and simmer, covered, stirring occasionally, for 15 minutes, or until potatoes are tender. 5. Remove from heat. Spoon into bowls and serve, sprinkled with bacon, if desired. *I find that rice flour actually works better to thicken in this recipe. Consider using it even if you don’t have to avoid wheat or gluten. ** Simmer chicken breasts on the stove in a pot of water for a couple hours (until tender). Use a fork or fingers to shred/break into pieces the chicken, separating from fat as you go (no need to trim chicken before cooking). Refrigerate or freeze prepared chicken until ready to use (thawing first, if necessary). This recipe is free of eggs, peanuts, tree nuts, fish, and shellfish. If you need to avoid coconut, use a milk alternative that is safe for your allergy set, and use one that is plain (NOT vanilla) and unsweetened. 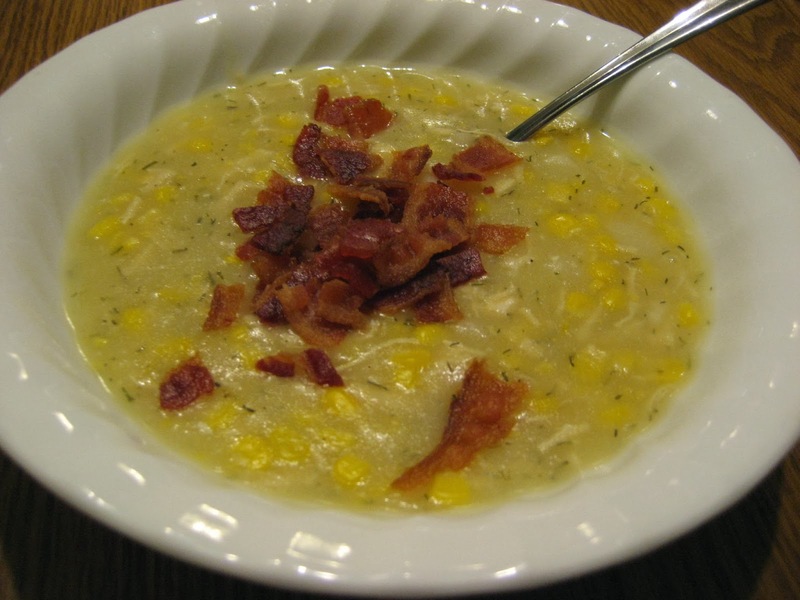 To be sure it is dairy-, wheat-, soy-, and/or gluten-free, carefully choose a broth and creamed corn with safe ingredients. To make it wheat and/or gluten free, be sure to use the rice flour option. Always double-check ingredients, including cross-contamination risk based on your level of sensitivity and comfort. This recipe can be made in 15 minutes or less (Category #2). 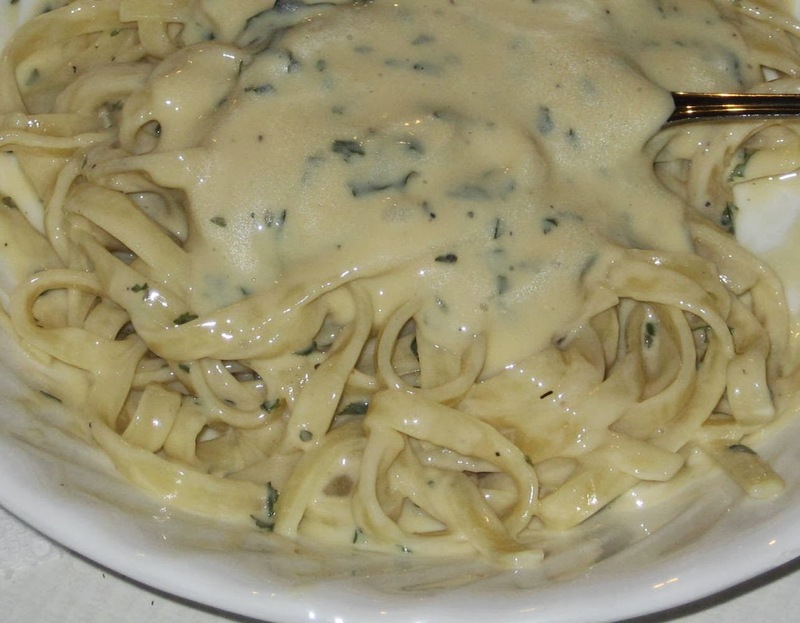 My family dubbed this sauce Un-Afraid-O because 1) it's not Alfredo; and 2) you don't have to be afraid of eating it! With the right ingredients, it is free of most major allergens and can be made gluten-free as well with a safe pasta. My mom's original recipe called for butter, heavy cream, and parmesan cheese; I created this dairy-free version, and it tastes just like the "real" thing!! 2. Meanwhile, in a separate large pot, melt margarine over medium-low heat. 4. Stir in seasonings. Reduce heat to low and let cook until pasta is ready. 5. Drain pasta and immediately add to sauce. Remove from heat. Mix well but gently, until pasta is coated evenly. 6. Serve with vegan parmesan-flavored “cheese”, if desired. *I use a whisk in this step. It helps to break up the “cheese” clumps. This recipe is free of dairy, eggs, peanuts, fish, and shellfish. To make it soy-free, be sure to choose a safe margarine and “cheese” (Daiya is soy-free). For tree-nut-free, do not use a nut-based vegan cheese (such as cashew or almond). Coconut is a seed, not a tree nut, but if you need to avoid coconut, choose a milk alternative that is safe for your allergy set, and use one that is plain (NOT vanilla) and unsweetened. To make it wheat and/or gluten free, use a gluten-free pasta (does not have to be fettuccine-shaped). Always double-check ingredients, including cross-contamination risk based on your level of sensitivity and comfort. The following recipe makes delicious, moist, banana-bread-like muffins. They turn out great every time, no matter what allergens (even gluten!) are avoided. Originally this recipe called for an egg, but I guess I copied it down wrong from my mother’s recipe card! I made it for years—egg-free and successfully!—before realizing the omission. Apparently it doesn't need an egg (banana acts as an egg in quick breads like this). I find this to be a great way to use up those over-ripe bananas! They are perfect for a simple breakfast, an accompaniment to brunch, or even an afternoon snack. I like to eat these muffins* smeared with “butter” (allergy-free, of course) and/or warmed slightly. 2. Grease muffin tin, or line it with paper baking cups. 3. Pour vinegar into a liquid measuring cup. Add enough milk to equal ¼ cup; stir and set aside. 4. In a mixing bowl, combine bananas, oil, and vanilla. 5. To a separate bowl, add sugar, flour, baking powder, and baking soda; mix well. 6. Add dry ingredient mixture along with milk mixture to banana mixture. 7. Beat on low speed or mix by hand until well combined, but be careful not to over-mix. 8. Place batter by large scoopful (about ¼ c.) into prepared muffin tin. Sprinkle each muffin with cinnamon-sugar before baking (optional). 9. Bake 15-18 minutes, or until toothpick inserted in center comes out clean. Cool on wire rack. Makes 12 to 15 muffins. *The batter can also be baked in a greased, 9-inch square pan instead of made as muffins. Bake at 350°F for 25-30 minutes; let cool in pan on wire rack. **Instead of peeling, cut bananas in half horizontally and simply squeeze out contents into a bowl. Use a potato masher to easily mash the bananas. This recipe is free of eggs, soy, peanuts, tree nuts, fish, and shellfish. To make it dairy-free, choose a milk alternative safe for your allergy set (I prefer canned coconut milk). To make it wheat and/or gluten free, use an all-purpose gluten-free flour (I used the Better Batter brand, which does contain xanthan gum). Always double-check ingredients, including cross-contamination risk based on your level of sensitivity and comfort. The Enjoy Life® brand is really a blessing to those with life-threatening food allergies. Everything they make is free of the eight most common food allergens; their products are also certified gluten-free. 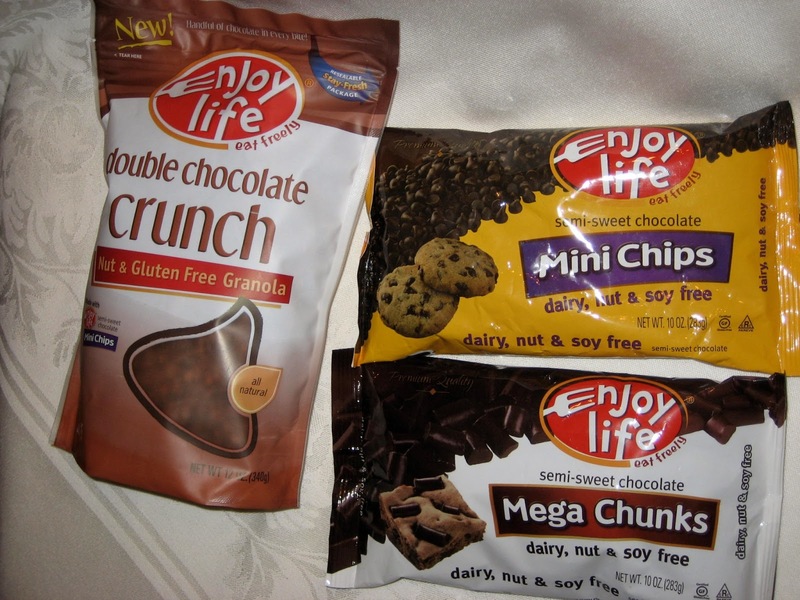 Enjoy Life® makes cookies, granola, snack bars, cereals, trail mixes, chocolate bars, and chocolate chips—but, let’s face it, I’m here to talk about the CHOCOLATE!! 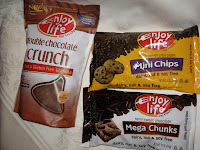 Enjoy Life® sent me two bags of chocolate chips (two different varieties) and one package of Double Chocolate Chunk Granola to review. Unfortunately, I could not test the granola since it contains inulin/chicory (one of my food intolerances). But Enjoy Life’s baking chocolate is wonderful! There are two different varieties: mini chips and mega chunks. They are made of real simple, all natural ingredients (Evaporated Cane Juice, Natural Chocolate Liquor (Non-Alcoholic), Non-Dairy Cocoa Butter). 1. As is! –unaltered, straight from the bag. -Grab a handful for a quick chocolate pick-me-up snack. -The mini chips make a terrific ice cream topping. -My kids and their cousins love using the mini chips to decorate frosted sugar cookies and cupcakes. 2. Melted!—both varieties melt exceptionally well, although the mini chips do so more quickly. I pour the desired amount of chips into a heat-proof bowl, and simply microwave the chocolate on high in 30-second intervals, stirring after each time, until it is smooth and melted. Some suggest adding corn syrup or shortening to the chocolate, but I have never found it necessary. -You can use this as a chocolate fondue in which to dip fresh fruit, cookies, or pretzels (or anything else you desire!). 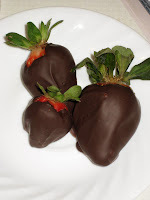 -I like to make chocolate-covered strawberries or pretzels (just dip until each piece is thoroughly coated, let excess drip off, place on a wax-paper-lined plate, refrigerate until chocolate is re-solidified, and serve). -When melted with milk (or any milk alternative), the chips make an easy chocolate icing for cake or cupcakes. 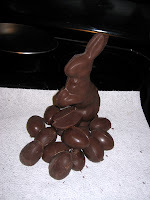 -My favorite use for melted chocolate is to make candy for my sons. Every holiday the “allergic community” scrambles to find safe chocolate in themed shapes (online or in store), and what little is available is expensive (plus shipping, if applicable)! If people knew how easy it was to make your own chocolate candy, allergy-friendly candy suppliers would go out of business. One bag of chocolate goes a long way when making candy, and, although Enjoy Life® chocolate chips are relatively expensive (about $5/10 oz. bag), I know the chocolate is “safe” and my method is much cheaper than buying already-made specialty chocolate candy. I simply pour melted chocolate into candy molds (very inexpensive online or at a cake/candy supply store, and they come in any shape/design imaginable!) and freeze until solid. I can’t tell you how excited my oldest son was when he got to eat his first solid chocolate Easter bunny! If you don’t have molds, you can pour melted chocolate into a paper-cup-lined mini muffin tin for individual chocolate candy cups. I love to add rice crispy cereal or coconut flakes for some variety; you can also make mint chocolate by stirring in a little (just a drop or two of) flavoring oil (NOT extract). -Simple chocolate raisins are another candy option. -Enjoy Life® does make chocolate bars (and they do taste like real milk chocolate, so much so that my mind had difficulty being convinced I wasn’t eating dairy! 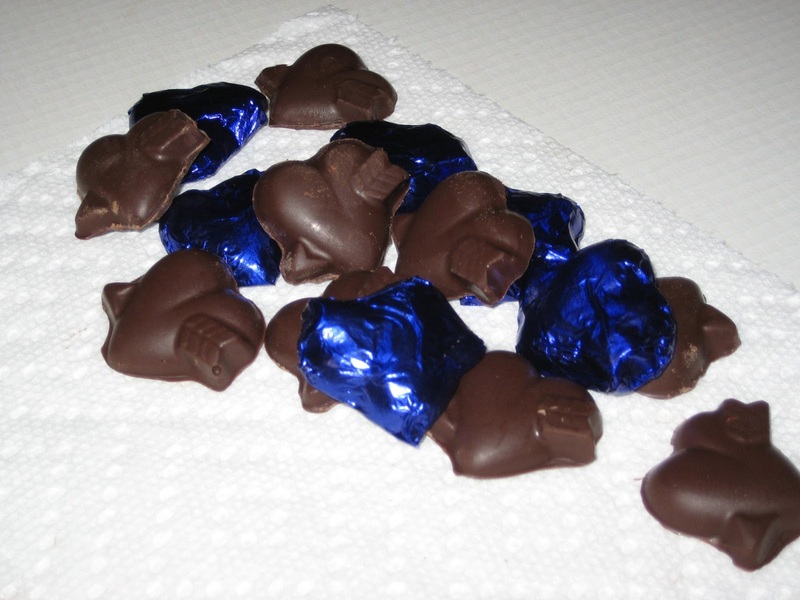 ), but sometimes I will make my own chocolate bars (pour melted chocolate chips into a wax-paper-lined pan). My boys love to use chocolate bar pieces to make S’mores. 3. In recipes!—any recipe that already calls for chocolate chips, or an addition to enhance a recipe. -I will admit, chocolate chip cookies are my weakness! And Enjoy Life® chocolate chips work perfectly in any cookie recipe, and in cookie bars, blondies, and brownies (in fact, I just used the mega chunks in my banana chocolate chip bars!). -The chocolate chips make hot cocoa extra rich! -You can also toss them into your favorite pancake batter. 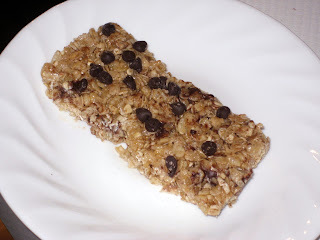 -The mini chips are an excellent addition to homemade granola bars; check out the allergy-friendly (and NO BAKE!) recipe below. A favorite snack item, these bars have simple ingredients, are easy to make, and require no baking! Enjoy Life® mini chips are perfect in them, but this recipe is very adaptable to individual preferences. You can add whatever spices or mix-ins you like to create your own version—try cinnamon and raisins, or coconut flakes and dried cranberries. The possibilities are endless! Lightly grease a 9” x 9” pan*** and set aside. In a large bowl, stir together oats and cereal; set aside. In a small pot, melt together butter/margarine, brown sugar, and honey over medium heat. Bring to a low boil; stir until well combined. Reduce to low and continue to cook another two minutes. Remove pot from heat and stir in vanilla extract. Pour this mixture over oats/cereal in large bowl; mix well until evenly distributed and all is moistened. Let mixture cool slightly, about 5 minutes. Then gently stir in ¼ cup of the chocolate chips (they will melt some, but this is OK). Transfer mixture to greased pan; spread out to an even thickness, pressing the mixture down to pack firmly together. Evenly sprinkle the remaining ¼ cup chocolate chips over mixture; use clean hands to press chips into the bars so they adhere. Do not cover while still warm! Cool thoroughly (at least two hours) before cutting into bars. (If you can wait, these are best made one day ahead of eating; the flavors seem to have more time to meld.) Cover with plastic wrap and store at room temperature. *The original recipe calls for quick cooking oats, but rolled oats should work fine too. Perhaps try a combination of both! **For a vegan version, you can substitute agave for the honey. However, you might want to reduce the amount so the bars are not too sweet. ***I originally tried these in a 9”x13” pan, but they came out too thin and crumbly. They work best in a smaller pan, packed in thick. If you don’t have a square pan, you can push the mixture to one side of a longer, rectangular pan (leaving part empty). This recipe is free of wheat, eggs, fish, shellfish, peanuts, and tree nuts. To make it dairy- and/or soy-free, use a safe margarine and safe chocolate chips (such as Enjoy Life® brand). To make it gluten-free, carefully choose oats that have been certified gluten-free and use a gluten-free crisp rice cereal. Always double-check ingredients, including cross-contamination risk based on your level of sensitivity and comfort. Have you noticed that most social gatherings in America involve food? This can make it rather daunting to plan or attend a party while having to take dietary restrictions into consideration. However, there are plenty of allergy-friendly snacks that one could simply buy or easily make. As always, be sure to double-check ingredients, including cross-contamination risk based on your level of sensitivity and comfort. (If you are hosting the party or making an item to bring to the party, it is very important to save labels for every ingredient used; only prepare foods using clean (not shared) utensils/cutting boards/serving dishes, and all new, unopened products—even items such as sugar could already be contaminated in the kitchen.) Carefully read labels, remembering that allergens and gluten can “hide” in a lot of processed food, and ingredients change without notice and vary from region to region. Not every brand or all varieties of an item listed below will be allergy-free; obviously choose safe versions based on your dietary restrictions. Contact me if you need recipes (for safe guacamole or bean dip or hummus, for example) or product recommendations. Air-popped popcorn sprinkled with salt and spices, or “natural” microwaveable popcorn (where the only ingredients are popcorn, oil, and salt). Corn tortilla chips and salsa, pico de gallo, and/or guacamole. Corn chips (like Fritos® with corn, oil, and salt as the only ingredients), served with a bean dip. Nachos—melt Daiya™ cheddar or pepperjack “cheese” on top of white corn tortilla chips. Fresh or canned fruit with coconut-milk-based yogurt for dip. Deli wraps—corn tortillas, turkey, lettuce, and mustard (or just use lettuce as the wrapper). Dried fruit (such as raisins, dried apricots) or fruit snacks. Homemade sweet potato chips—peel and slice sweet potatoes into 1/8”-thick rounds, toss with olive oil and salt, adding other spices, if desired; place on foil-lined pan and bake at 400° for 25 minutes, flipping once, until edges are crisp. Baked/microwaved snack mixes using safe margarine and safe cereals (Chex® even comes in several gluten-free varieties)—make a salty mix using savory herbs/spices and air-popped popcorn; or a sweet version with honey, raisins, marshmallows, and apple-pie-type spices. Cocktail links or cut-up hot dogs, speared with toothpicks, served with safe barbecue sauce or mustard. Trail mix of safe cereals, marshmallows, dried fruit, and safe chocolate chips (e.g. ones from Enjoy Life®). Cupcakes—CherrybrookKitchen®’s Gluten-Free Dreams Chocolate Cake Mix (using baking instructions given on box) and their ready-to-spread vanilla frosting. Sliced Daiya™ wedge "cheese" and/or pepperoni with crackers from Crunchmaster® (Multi-Grain Crackers in Sea Salt, or 7 Ancient Grains Crackers in Hint of Sea Salt, or Baked Rice Crackers in Toasted Sesame). Cereal bars using safe margarine or oil, marshmallows, and crispy rice cereal. Always a favorite at parties, this recipe is easily doubled—which is a good idea since these tasty appetizers will be snatched up quickly! You will also need wooden toothpicks for this recipe, enough so that there is one toothpick per water chestnut (the recipe yields about 50). Soak toothpicks in a bowl of water for 10 minutes. Drain water out of water chestnuts cans. Slice each raw bacon strip into thirds. ** Place one water chestnut in center of each bacon piece; wrap bacon around water chestnut, securing ends with a toothpick. Meanwhile, in a small saucepan, stir together ketchup, brown sugar, and Worcestershire sauce. Cook over medium heat just until boiling; mix in red pepper (if using). Remove from heat; set aside. Pour sauce over the bacon-wrapped water chestnuts, being careful not to get sauce onto exposed toothpicks (for cleaner handling and better appearance). Return to oven; bake 30 minutes longer, until sauce is bubbly and appetizers appear candied. Arrange neatly on serving dish. *You can substitute the Worcestershire sauce with soy sauce, prepared mustard, or even apple cider vinegar (just a little something to give the sauce some tang), choosing allergen-free versions if necessary. **To easily and quickly slice bacon, remove from package, maintaining the flat stack, and use kitchen shears to cut through stack in two places, dividing evenly into thirds. ***They fit fine in a 9”x13” glass pan for this step; they tend to “shrink” slightly while baking. Alternatively, you can use your oven's broiler pan; no need to drain grease or to transfer to a clean pan. This recipe is free of dairy/milk, eggs, shellfish peanuts, and tree nuts (“water chestnuts” are actually a vegetable, not a nut). To make it fish-, wheat-, gluten-, and soy-free, carefully choose a Worcestershire sauce with safe ingredients (many brands aren’t allergen-free; contact me if you need product suggestions as there are options out there), or use one of the listed substitutions (see TIPS above), or just omit entirely. Always double-check ingredients, including cross-contamination risk based on your level of sensitivity and comfort. After the food-laden holidays, January generally brings about the desire for healthier eating. Yet most people eventually abandon their New Year’s resolutions. Research shows that only 12% achieve their set goals. To ensure success, try establishing smaller, more attainable objectives. When baking, substitute whole-wheat flour for up to half of the all-purpose flour called for in a recipe. Use plain regular or Greek yogurt in place of mayonnaise or sour cream. There are also dairy-free yogurts (soy-, rice-, or coconut-milk-based) that would work equally as well. Great for chicken salad and in tacos! Substitute lean ground turkey for ground beef. This change results in no significant difference in the taste, texture, or consistency. Make homemade salad dressing using olive oil, vinegar, and fresh herbs. Not only is it money-saving, but it is also healthier; some bottled salad dressings contain added preservatives and excess fat. Vegan cheese is a great alternative to regular cheese. When substituted in recipes, there is almost no discernible flavor difference. Mix your own fruit-flavored yogurt at home. Buy a large container of vanilla yogurt (again, dairy-free versions work just as well); scoop out individual portions and add sugar-free fruit preserves or even fresh fruit. For one meal each week, choose to eat meat-free or vegan. (Bonus: Doing this reduces your carbon footprint more than if you were to eat/buy local 7 days a week!) Visit Meatless Monday for more information on this movement. Also, check out the quick, easy recipe below to get you started! This healthy recipe can be easily prepared with ingredients normally kept in one’s winter pantry. To make it truly vegetarian, be sure to use vegetable broth instead of chicken stock. Please note that the listed herbs are dried, not fresh. Add fresh onion (if using) and garlic; sauté until veggies are soft but not yet brown. Stir in tomatoes, broth, beans, and seasonings, including dried onion (if using). Bring to boil; stir in pasta. Reduce heat to low; simmer, covered, for 20 minutes or until pasta is tender, stirring occasionally. *To easily chop fresh tomatoes, reserving their juice, first remove stem and core. Then add them whole to a large liquid measuring cup; use kitchen shears held straight up and down to roughly chop them. Bonus: the amount needed can be seen right on the measuring cup as you chop! **Reduce the amount of pepper if you are sensitive to spicy foods. Feel free to add more pepper during cooking if you like your soup spicier. ***I omit the additional salt from this recipe when I make it. As most canned tomatoes, beans, and broth already contain salt, adding more to the soup can be too much. Adjust to your taste preference. This recipe is free of eggs, peanuts, tree nuts, fish, and shellfish. To make it dairy-, wheat-, soy-, and/or gluten-free, carefully choose a broth with safe ingredients. To make it wheat and/or gluten-free, use a gluten-free pasta (alternatively, you can omit the pasta altogether, increase the beans to 3 cans, and scale down the amount of broth). Beans are naturally gluten-free, but canned ones can sometimes contain other non-GF ingredients (look for cans that list only beans, water, and salt as ingredients). Always double-check ingredients, including cross-contamination risk based on your level of sensitivity and comfort.